Cat Boarding. Meadowsweet Pet Boarding and Care. Wilmington, N. C. 910/791-6421 Loving care for dogs, cats, birds, and other small pets. 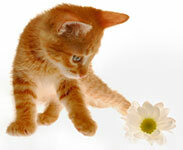 MeadowSweet Pet Boarding has the perfect environment for your feline friends. Our feline facility features a separate climate controlled building for your kitty. Each custom condo is approximately 4' x 3'. Condos feature several shelves for climbing and window views for sun bathing and sight seeing. Some condos can be connected to accommodate larger families wanting to stay together. MeadowSweet provides blankets and bedding for all guests. However, you are welcome to bring bedding and toys for your pets. Please keep in mind, however, that sometimes bedding becomes a toy. So please do not bring anything that you cannot replace. We cannot be responsible for personal items. For the health and well being of your pet, and others, MeadowSweet requires that all appropriate immunizations are current. Kennel baths are available Sunday through Friday and include shampoo and rinse, nail trim, and ear cleaning. Pets departing on Saturday can be bathed on Friday. Bath prices vary depending on the size of the cat and coat type. See our RATES page for current fees.